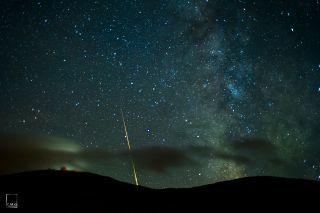 Christopher Georgia took this photo of the Milky Way as a meteor shot across the sky in July near Cannon Mountain Observatory in Franconia, N.H. He used a Nikon D3s camera, Nikon 50mm lens, exposure of 10 seconds, f/2.8 and ISO 2500, to capture the image. The photo was release to SPACE.com July 17, 2013. Sometimes the best is saved for last. It certainly was the case for one night sky photographer, who was about to pack up from a night of taking time lapse images of the Milky Way when a bright meteor shot across the sky, as seen in this spectacular photo. "I had been running a 50mm time lapse of the Milky Way passing behind Cannon Mountain Observatory for just about two hours on Friday night. Many meteors were lighting up the sky throughout the night," photographer Christopher Georgia wrote SPACE.com in an email. Georgia took this shot in July near Cannon Mountain Observatory in Franconia, New Hampshire. He used a Nikon D3s camera, Nikon 50mm lens, exposure 10 seconds, f/2.8 and ISO 2500, to capture the image. The photo was release to SPACE.com July 17, 2013. Editor's note: If you have an amazing night sky photo you'd like to share for a possible story or image gallery, please send images, comments and obseving equipment details to managing editor Tariq Malik at spacephotos@space.com.